One in seven Americans, including more than 8 million children, does not have even basic healthcare coverage. Sarah Palin was partially right when she said there would be DEATH PANELS in America. Where she was wrong was pointing to the government and saying that they were going to create them. In actual fact they already exist. They exist in the health insurance industry. 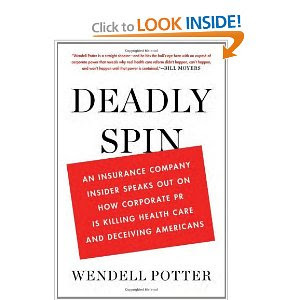 Wendell Potter has exposed the practices and deceptions of the health insurance industry that they have practice upon the American people. He has exposed the corruption of an industry that bought the best government that money can buy. Supported by Fox News, and the Gay Old Party, the GOP, the health industry and spun a campaign of deception that has pulled the wool over the eyes of the American people and had many voting against their own self interest. In Deadly Spin Wendell Potter lays it bear.